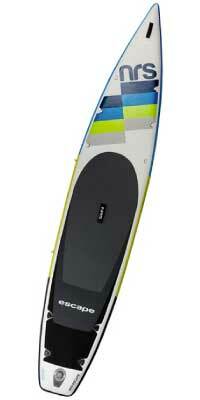 Inflatable stand up paddle boards, also known as iSUPs, have become increasingly popular in recent years. As more people travel, lugging traditional stand up paddle boards has become too burdensome. 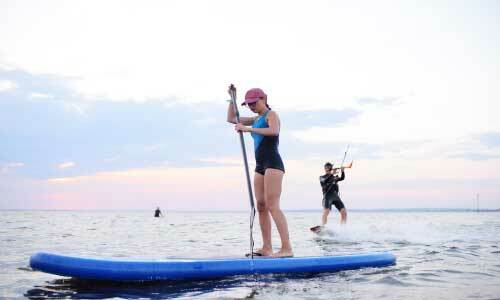 People are now turning to inflatable stand up paddle boards to relieve that burden. Inflatable stand up paddle boards are the ideal board for travelers. These boards inflate and deflate, allowing you to roll them into a small bag and bring it wherever life takes you. When deflated, most boards can fit in the trunk of a car, in small closets, and into suitcases. In fact, many of them are small enough to bring on an airplane. But that, of course, depends on the size requirements of the airline and the particular board. Despite being primarily composed of air, inflatable stand up paddle boards are just as rigid as hard stand up paddle boards. However, because they’re filled with air rather than fiberglass or other hard materials, the impact of falling on the board is less harsh, making iSUPs a particularly popular choice for SUP yoga. If you’re interested in joining this craze, read our article on how to stand up paddle board. The history of stand up paddle boarding is rather fuzzy. The dates and places of origin in which the sport started are frequently debated. One thing that is mutually agreed on, however, is that stand up paddle boarding is nothing new. Stand up paddle boarding dates back thousands of years, with the first records documented as early as 1,000 B.C. The history of modern stand up paddle boarding is more recent, dating back to Hawaii in the early 1900s. The sport became very popular and spread to countries across multiple continents, including Peru, Israel, China, and Italy. Just a few years ago, inflatable stand up paddle boards were introduced, reshaping the entire sport. Inflatable stand up paddle boards are around the same length as traditional stand up paddle boards. They generally span longer than 9 feet. However, the length of the board depends on the type of riding you’re going to be doing. The best thing about iSUPs is that when the board is not in use, they can be rolled up to the size of a sleeping bag, making them incredibly portable. The width of an inflatable stand up paddle board depends on the style of riding being done on the board. Inflatable SUP for surfing– These boards have a narrow tail and a wide nose to provide a stable and smooth ride on a wave. 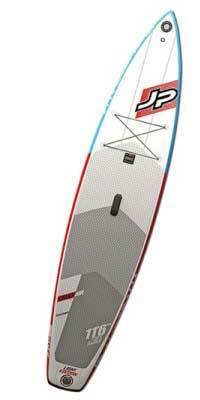 Inflatable SUP for racing– These boards are designed for speed, making them narrow. This allows the board to cut through waves. 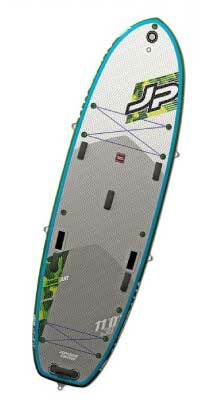 Inflatable SUP for fishing– Fishing requires a lot of gear, so these boards are wide, offering enough space to store your tackle, rod, and other fishing gear. Inflatable SUP for touring– These are neither wide or narrow, allowing the board to glide on the water while offering a stable platform for the rider. A good inflatable SUP should be around five to six inches thick in order for it to hold form on the water and prevent sinking in the middle of the board. Most inflatable stand up paddle boards have planing hulls. Planing hulls are wide and flat and are intended to glide on top of the water. Boards with these hulls are good for stability and versatility, meaning it can be used for a number of styles of riding. All inflatable SUPs are made with drop stitch technology, in which small fibers are woven into the inside of the board. When the board is inflated, those fibers are stretched and almost interlock, providing the board’s rigidity and making you feel as though you’re standing on a hard surface. Think of drop stitch technology as a bridge. The bridge support beams connect the bridge itself to the ground, holding it up. This is the same concept for drop stitch technology, in which the fibers connect the top and bottom of the board, holding it up. When the board is deflated, the two layers of the fibers rest almost completely flat, allowing you to roll it tightly. Because drop stitch material on its own is not airtight, manufacturers glue or laminate a layer of polyvinyl chloride, PVC, onto the top and bottom of the drop stitch material, sealing in the air. The portability of iSUPs is undoubtedly the main reason they are so popular. Because they inflate and deflate, they take up much less space than hard boards. If you’re looking to purchase a stand up paddle board that is highly portable, inflatable SUPs are the way to go. These boards are more durable than hard boards. In fact, when completely filled with air, they’re about 80% to 90% as rigid as traditional hard stand up paddle boards. The rigidity of the inflatable board depends on the amount of air filled, so it’s important to make sure the board has enough air pressure for it to be able to hold your weight and perform properly. The stability of an inflatable SUP depends on the style of riding you’ll be doing. Inflatable SUPs used for yoga or fishing are wide and thick because they are not designed for speed. They provide a larger surface area on which to move and offer plenty of stability. Other inflatable SUPs, such as those used for surfing and racing, offer less stability. As mentioned before, all inflatable stand up paddle boards are made with drop stitch materials and at least one layer of PVC laminate. When choosing a board, look for one that has more than one layer of the PVC laminate. Two layers of PVC laminate seals in the air better and adds thickness to the board. Inflatable SUPs are lighter than their traditional counterparts because they are primarily composed of air, making paddling on an iSUP easier than on hard boards. In general, the difference in speed between inflatable stand up paddle boards and traditional stand up paddle boards is minimal. But when comparing the speed between the different types of iSUPs, it depends on the style of riding you will be doing. Those intended for yoga and fishing are less fast, whereas those used for racing, touring, and surfing, are designed for speed. Inflatable stand up paddle boards can cost anywhere from $200 to $2,000, depending on a number of factors. A good price for an iSUP is around $900, whereas $1,250 is standard. The two most important accessories for any stand up paddle board are a paddle and a leash, but unfortunately not all boards come with them. Most boards, however, do come with a bag or backpack to store the board in once deflated. While this accessory is not crucial, it makes traveling with the board much more convenient. For iSUPs that come with a bag, the quality of the bag depends on the price of the board. Every inflatable board also comes with a repair kit, but the likelihood that you’ll need to use it is slim. For more details on choosing a stand up paddle board then check out on guide. 10' 6'' X 33″ 23 lbs. 11' X 36″ 31 lbs. 11' 6'' X 30″ 17.2 lbs. 11' X 38″ 26.9 lbs. 12'6'' X 30″ 27 lbs. 11' X 39″ 30 lbs. 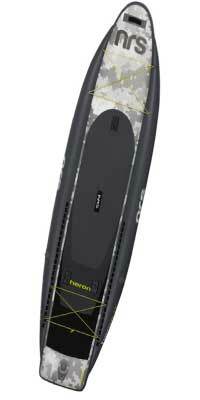 The SurfTech airSUP is the perfect inflatable board for beginners or casual riders. This board is designed for, but not limited to, recreational use. Measuring 10 feet, 6 inches long and 33 inches wide, its surface area is not too large and not too small, providing riders with a comfortable, stable, and easily maneuverable surface. This inflatable board is made up of thousands of internal drop stitch fibers, providing a rigid and secure platform. This board is definitely the best bang for your buck. 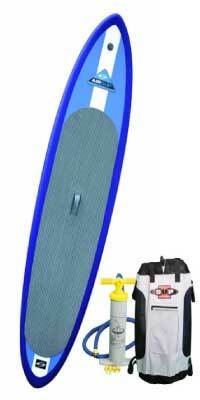 It comes with a durable travel backpack to roll the deflated board into and a two-way air pump to make inflation as easy as possible. And when deflated, the board only weighs 23 pounds. If you’re a beginner or casual paddle boarder, this iSUP is the way to go. 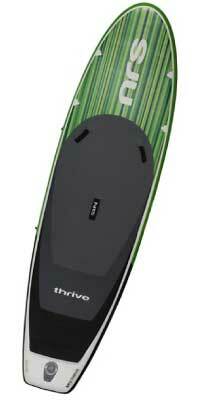 The NRS Thrive is a great board for touring, fitness, and light river paddling. It is 11 feet long and 36 inches wide. While it offers a great amount of stability, you’re unfortunately sacrificing a bit of speed. The NRS Thrive is made with drop-stitch materials and PVC lining with double sidewall construction for increased durability. This board is averagely priced for inflatable stand up paddle boards, but what makes this iSUP stand out is that it comes with a ton of accessories, including a high-pressure pump with a pressure gauge for convenient inflation, a travel pack for easy storage, a repair kit, and a shoulder strap for easy carrying. The JP CrusAIR’ LE is designed for everyday paddling, touring, and fitness. The board is on the narrow side, measuring 11 feet, 6 inches long and 30 inches wide. If you’re looking for speed, this is a great board. Even though it’s narrow, you won’t have to compromise stability. This board is the revamped model of JP’s bestseller, offering more width in the tail to increase stability and improve traction. It is made from two laminated PVC layers and drop-stitch fibers, sealing in air and creating 6 inches of thickness, with a double wall rail. The downside of this board is that it comes with very few accessories. The only thing included with this board is a bungee rope on the nose. It does not come with an air pump, a pressure gauge, or a backpack like others do. However, the board is cheap, leaving money left over to purchase those accessories that are not included. 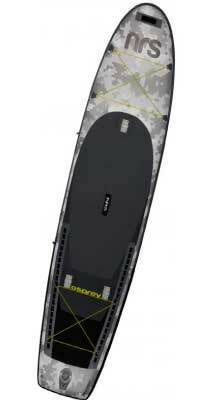 If you’re looking to buy an inflatable SUP for fishing, the JP AnglAIR SE is a great choice. It measures 38 inches wide and 11 feet long, providing you with an extremely large and stable platform. If you’re looking for speed, however, this is not the board you want to purchase. The JP AnglAIR SE is made from two laminated layers of PVC around thousands of drop-stitch fibers, making it highly rigid and extremely durable. It has ample storage space and accessory mounts to secure all of your fishing gear, including a bungee rope on the nose and tail, a paddle holder, two Scotty mounts on the tail, and a kick up fin. This board costs is in the medium price range of iSUPs in this guide, but for all of the accessory mounts it comes with, this is a great deal. The NRS Osprey is a fishing iSUP. It measures 11 feet in length and 34 inches in width. This board is stable, allowing you to confidently move around on the board without risking falling in. Its outer shell is made from PVC laminate and covers the interior drop-stitch fibers. It also has double sidewall construction to protect you in any type of water condition. The Osprey is lower on our list because it is designed particularly for fishing. If you’re looking for a board that can be ridden in different styles, we would not recommend this one. However, if you’re specifically looking for a fishing board, this is a good choice. Included with the board are all the accessories needed to have a successful fishing excursion. It comes with three accessory mounts, bungee deck riggings in the rear and front and six stainless steel D-rings, a travel bag, and a high-pressure pump with a gauge. The NRS Escape is a touring board that measures 12 feet, 6 inches long and 30 inches wide. The long and narrow shape of this board makes it great for speed and long distances. But because it is very long and narrow, this is not a good board for beginners or casual riders. The shell of this board is made from PVC laminate, covering the drop-stitch interior. It also has double sidewall construction to increase durability and streamlined aesthetics. The Escape comes with many accessories, including a travel bag, a high-pressure pump with a gauge, and removable and interchangeable fins, allowing you to customize your set up. It also has 12 stainless D-rings to maximize your options for attaching additional accessories. This board is made from heavy-duty drop stitch technology and is able to withstand all types of water conditions. It comes with three accessory mounts, bungee deck riggings on the rear and front and six stainless steel D-rings. It also comes with a bag, in which you can store your deflated board in. The biggest downside of this iSUP is the price. It’s on the expensive side of the market but is one most avid anglers prefer because of its durability and maneuverability. So, if you’re not looking for a fishing board, in particular, we would not recommend purchasing the NRS Heron. There are many factors to consider when buying an inflatable stand up paddle board, and with so many options on the market, it’s hard to know which one to choose. We hope that with our iSUP characteristics list, our buyer’s guide, and our top seven choices, you’ll walk away with a better understanding of inflatable stand up paddle boards and will go into the buying process with confidence!